Published: Dec. 16, 2018 at 04:07 p.m.
Cincinnati Bengals wide receiver Alex Erickson darts past blocks for a 77-yard kick return. Published: Nov. 19, 2017 at 05:17 p.m.
Cincinnati Bengals quarterback Andy Dalton throws to Alex Erickson for a 29-yard touchdown. Published: Sept. 14, 2017 at 09:59 p.m.
Watch Cincinnati Bengals quarterback Andy Dalton buy time and scramble to find wide receiver Alex Erickson for a 37-yard pick up. 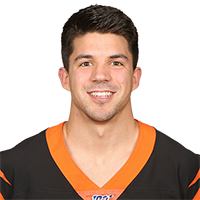 Published: Dec. 18, 2016 at 02:15 p.m.
Cincinnati Bengals wide receiver Alex Erickson takes kick return for 72 yards.